Source: Produced in E. coli. Human αA-Crystallin is fused at the N-terminus to a His-tag. Formulation: Liquid. In 50mM TRIS, pH 7.5, containing 50mM sodium chloride and 5mM DTT. Scientific Background: Alpha-crystallins, composed of alpha A (~20kDa) and alpha B (~20kDa) subunits, are major water-soluble proteins accounting for almost 50% of total protein in the mammalian transparent eye lens and they are also found in a variety of other tissues. The two other crystallin families, beta and gamma, are homologous to each other but not to the alpha family or the sHSP’s. Alpha-crystallins are also referred to as small heat shock proteins, since they are induced by increased temperature in a variety of organisms. The alpha-crystallins have sequence homology as well as structural and functional similarities with the small HSP’s such as HSP25/27. Most small heat shock proteins have four common structural and functional features: (i) molecular weight between 12 and 43kDa; (ii) the formation of large oligomeric complexes composed of alpha A-crystallin, alpha B-crystallin and HSP25/27; (iii) the moderately conserved alpha-crystallin domain in the central region of the protein; and (iv) molecular chaperone activity. The alpha-crystallin domain comprises approximately 90 residues, is bounded by variable N-terminal and C-terminal extensions and is involved in oligomer assembly. Oligomers can reach 800kDa or more and are dynamic, exhibiting subunit exchanges and organizational plasticity, possibly leading to functional diversity. Phosphorylation of serine residues occurs during development and in response to stress, and usually decreases oligomer size. Chaperone activity requires, and is modulated by, oligomerization and is limited to binding unfolded intermediates to prevent irreversible aggregation, although productive release and refolding of denatured proteins requires close cooperation with other chaperones. Other proposed functions include a role in membrane stabilization and modulation of intermediate filament organization during physiological stress and neurodegenerative disease. 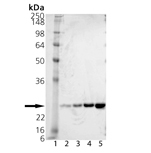 Western Blot analysis: Lane 1: MWM, Lane 2: 100 ng, Lane 3: 200 ng alpha A-Crystallin (Human), (recombinant), Lane 4: alpha A-Crystallin (Bovine), (native) probed with alpha A-Crystallin pAb. SDS-PAGE analysis: Lane 1: MWM, Lane 2: 0.5µg, Lane 3: 1.0µg, Lane 4: 2.0µg, Lane 5: 4.0µg alpha A-Crystallin.